The drug policy world’s been spinning pretty quickly lately and the Drug Foundation’s been in the thick of it. Notably, there’s been the recent landmark United Nations General Assembly Special Session (UNGASS) on the world drug problem, but we’ve also been progressing our own projects. We thought it was time for an update. The Drug Foundation had strong representation at this hugely anticipated international hui, to try and move forward on the challenging issues of global drug policy. Our Executive Director Ross Bell was on the government delegation and our Board Chair Tuari Potiki addressed the assembly. 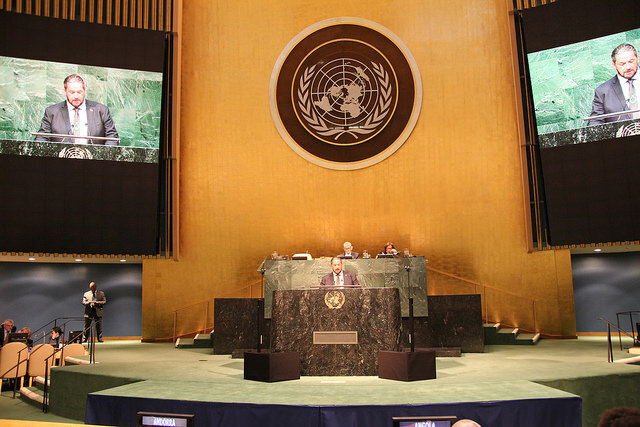 View the video of Tuari Potiki speech to the UN General Assembly (YouTube). While the UNGASS Outcome Document did not deliver the hoped for strong signal of change of direction away from criminal justice towards health based responses, there were some real positives, particularly from New Zealand delegates. Tuari’s speech was rousing and confronting with a clear ‘support don’t punish’ message and Associate Health Minister Peter Dunne’s speech, arguing for bold new approaches, firmly set NZ amidst the progressive set of nations at the UN. A concise summary of what happened at UNGASS by our communications adviser Cameron Price. A collection of tweets and images as UNGASS unfolded, including NZ media coverage. UNGASS outcomes overview and critique from International Drug Policy Consortium. There were also some powerful statements for reform made prior to UNGASS. Significantly, the Johns Hopkins-Lancet Commission on Drug Policy and Health recommended countries decriminalise minor, non-violent drug offences and strengthen health and social-sector alternatives, in a damning report on punitive drug law. Read The Lancet: Public health and international drug policy. Back in Aotearoa, we’ve been working on opioid overdose prevention for some time, particularly extending access to the lifesaving opioid antagonist drug naloxone, and we’ve established an overdose advisory group comprising external experts. With Australia recently making naloxone available from pharmacies, the first step our group took was to encourage our Medicines Classification Committee (MCC), which reviews these Australian decisions, to do the same here. We should know by June the MCC’s decision on this. The difficulty of accessing medical cannabis products in New Zealand has had ongoing publicity. We’ve been continuing to advocate for a more accessible compassionate scheme for people to access products, particularly if they’re terminally ill.
Minister Dunne has agreed to review the criteria for approving cannabis medicines, but there’s unlikely to be significant change in the short term. This is quite a complex and misunderstood area, so we produced a medical cannabis Q&A to enhance the debate. Read the NZ Drug Foundation's medical cannabis Q&A document. Last year we received funding from the J R McKenzie Trust for a community action project (Tautāwhihia. Kaua e whiu) to support Māori communities to have the capacity and capability to advocate for health-focused drug law reform. Māori are disproportionately impacted by our punitive drug laws. We’ve appointed Gilbert Taurau (nō Ngāpuhi me Te Ātihaunui-ā-Pāpārangi) as Principal Adviser, Māori Liaison and Advocacy and are excited about getting this project underway soon.